A quality layered plywood table top sits upon an elegant and durable wire base to create the Wire Base Side Table by Inmod. A completely modern look that was influenced by Japanese design, it is stocked, affordable and ready to complete your homes design scheme. Simple and elegant, the Wire Base Side Table's look was influenced by the serenity of Japanese design. It was designed originally as a table on which to serve tea during Chanoyu, the traditional Japanese tea ceremony. Asian influence can clearly be seen in this table's design as well. 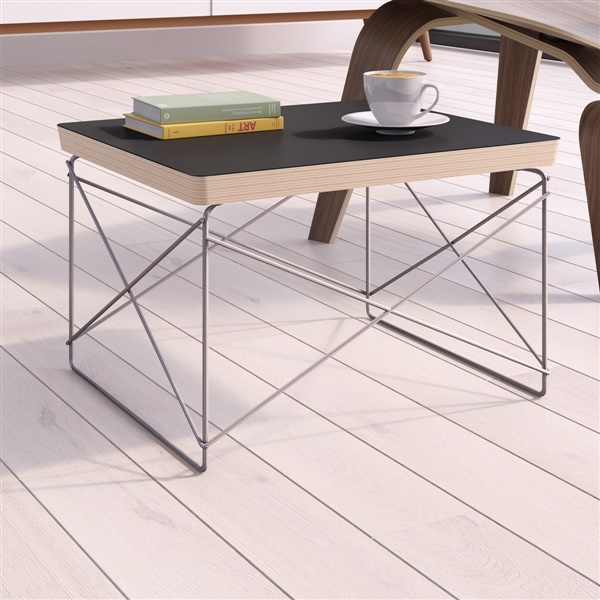 The Wire Base Side Table offers true versatility and can be used in any room of the home. Use it as a night table next to the bed, an end table in the living room or to perfectly complement an entryway. I have the Eames side table , white with chrome. I purchased the walnut and chrome from inmod. Appears to be identical in weight size and craftsmanship. The Eames chrome may be slightly brighter, maybe. just wanted something straight forward and a nice shape, the base gives it a little extra style, love it! High-quality, well-made, love the base design, arrived in a timely manner! This is really a well built table. It arrived well assembled, and the wood used for the table top is solid. The design is true to the original. InMod really impressed me with its excellent customer service. After seeing the quality of the product and of the company first hand, I will definitely be purchasing items from this company again. We have several real Herman miller items and the quality of these was just as good--we were very surprised. Where is the table made? The Wire Base Side Table is manufactured in China. What type of plywood is used in this reproduction? It is a multi-layer, Birch plywood. The product description reports the height of this table at 10 inches. Is this correct? Yes, the table height is 10". The original table has a textured melamine top surface. Does the reproduction have this as well, or is the stop flat lacquer? The materials used on our reproduction are similar to what is currently used on current production of this item. It is a flat melamine surface.